Are you taking your choices for granted? Are your choices shaping your life? What goes in to your marinade for choice? Are the ingredients giving you your best life banquet? 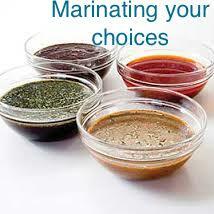 I was thinking marinade is a great analogy for what goes into how to make the choices in my life. To marinate you need the best ingredients, know your flavours and what will work together to give you the result you are after. As I marinade I think about what herbs and spices, oils and vinegars I know and what I know of their taste that would make this meal special and delicious. I choose from what I have tasted before or look up a recipe to try something new. I ponder the 'what if' and imagine the finished meal. It's a simple lesson for looking at choice, it's not meant to be so hard that you freeze and don't know what to do next and leave the choices to others to make for you. Here is a different, fun way to look at making choices and how to marinate your choices. Just like a great marinade you need the key ingredients. The choices you make are based on your wants, desires, needs. You need to know that you have a mix of ingredients and keep this as your focus if you want the best. How will these choices help you to make the most of what you want and what you attract into your life? Imagine what it will look like, what it will feel like and how you will act when the choice has been made. Believe in yourself, how you have done it in the past, what you have learnt and look at the possibilities of something new for you. The more you keep making choices that have the key ingredients, know what you want and the courage to stick with it, you will be throwing out the old "I don't know", and the "I can't do this"
It takes time to marinade, sometimes overnight. It is best not to rush or be coerced into choices that may not bring out your best. It's ok to say "This choice needs my careful consideration and I will have an answer that will be good for me."